VATICAN CITY —Hope is the first act of resistance to evil, Pope Francis told the people of Naples as he pleaded for respect for the dignity of immigrants, jobs for the unemployed and the conversion of the city’s notorious mafia families. The Gospel teaches that the truly blessed are the poor in spirit, the nonviolent, the meek, those who work for peace and justice. This is the force that will change the world,” the pope said March 21 as he celebrated Mass in Naples’ iconic Piazza del Plebiscito. Pope Francis’ 10-hour visit began with a brief stop for prayer at the Shrine of Our Lady of the Rosary in Pompeii and included a visit to a notoriously rough periphery neighborhood, Mass in the center of town, lunch at a local prison, a meeting with priests and religious, a visit with the sick and a seaside gathering with young people and the elderly. As he was being driven along the waterfront at the end of the day, the crowd lining the road made way for a pizza maker. Although the popemobile did not stop, it slowed down enough for the flour-covered artisan to hand his pie to the pope. The Vatican did not release information on the pizza’s final fate. During his morning meeting with residents of the city’s Scampia neighborhood, an area of poverty and degradation, an immigrant woman from the Philippines asked the pope to please remind people that immigrants are children of God. 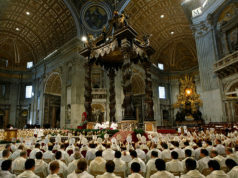 The pope also insisted, loudly and repeatedly, that high unemployment rates, especially among youths, were a detriment to society and a failure of the current economic system and public policies. The problem is not simply the poverty joblessness creates, he said, but the way it robs people of dignity and of hope for the future. “When one is unable to earn his daily bread, he loses his dignity,” the pope said. “Tell me,” the pope told the crowd in Scampia, “if we close the door on migrants, if we take away the jobs and dignity of people,” what will happen? Corruption “is a temptation, it’s a slide,” he said. Everyone has within them the possibility of being corrupted, of paying someone under the table or looking for easy cash, he said. After Mass, Pope Francis went to a local prison, where he had lunch with about 100 prisoners, who had been chosen by lottery. They reportedly included 10 people from a prison block set aside for inmates who are homosexual, transgender or HIV-positive. Although he had prepared a speech for the inmates and prison staff, the pope set it aside and spoke informally, telling the prisoners that everyone has made mistakes, but the important thing is to make amends, get up and try to live a better life. 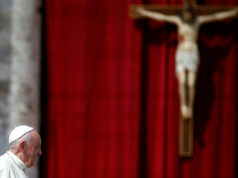 Ending the day with young people and the elderly, the pope admitted to being “really tired” by the day’s busy schedule. He joked with a woman identified only as Erminia, who told him she was 95 years old. “If you are 95, I’m Napoleon,” he told her. Pope Francis denounced the “hidden euthanasia” of withholding medicine from the aged, “not giving them care, making their lives sad” and allowing them to die alone. Angelo and Caterina Russo, who direct the Naples archdiocesan family life office, asked the pope’s advice for dealing with the current crisis in marriage and family life. 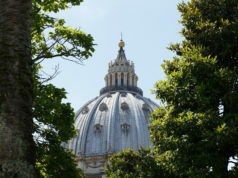 Pope Francis said, “I don’t have the recipe” for changing the situation, but he is convinced that October’s world Synod of Bishops on the family could be a start for the church. He also denounced “gender theory” for undermining marriage by creating confusion about what it means to be a man or woman. Without a solid upbringing and education in the meaning of love, marriage and family life, he said, even the best marriage preparation courses cannot create a Catholic husband and wife. It is not “like a language course: You’ll be spouses in eight lessons,” he said. And, as he frequently does, he told married couples it is natural to fight, even throw things, but it is important never to end the day angry. “Plates can fly,” he said. “Have you broken a few?” he asked the Russos, who have been married 31 years.